It's hard to believe it has been one year since the home waterbirth of my son Joshua. He's grown into a 22-pound healthy, happy, loving toddler and I couldn't be more blessed. 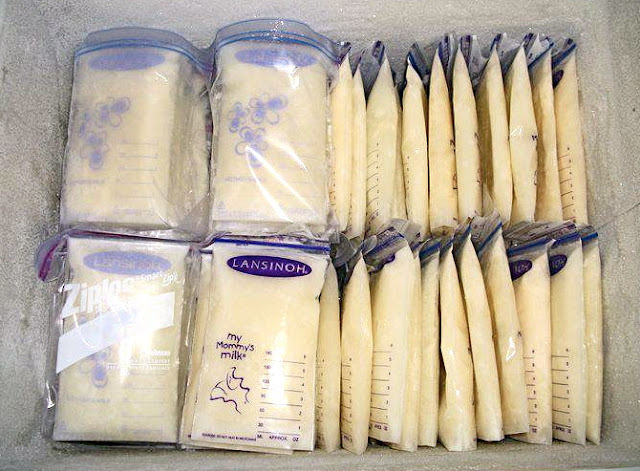 It has been 10 months since we received our first donation of breastmilk through the Human Milk 4 Human Babies Global Network. 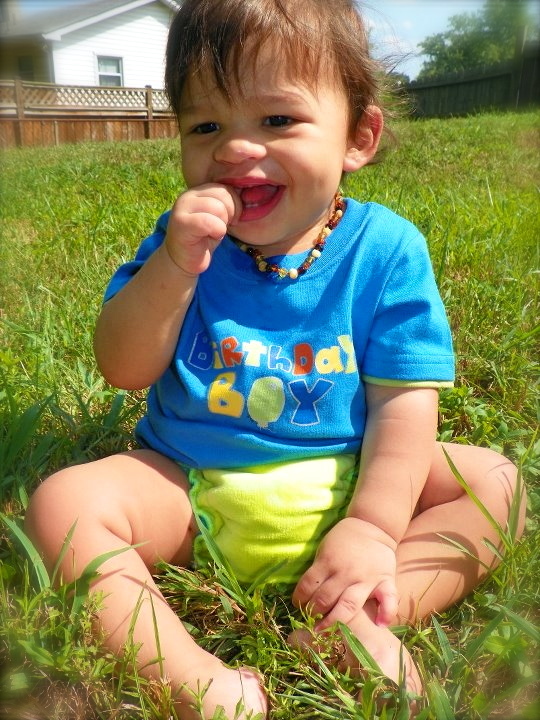 He has been exclusively breastfed, minus a small amount of solids here and there, for these past 10 months as well. We haven't needed a single drop of formula. Twenty incedible mothers have donated their milk to us. I have traveled to and from 5 different states, excluding the travels within my own to pick up milk. It has been a wonderful journey, but we're not stopping here. One may think these nutritional percentages of human milk do not apply in Joshua's situation because I am not the mother producing his milk. The milk that Joshua consumes, for example, does not know his age. When nursing, breastmilk typically changes with time to meet a growing child's needs. Receptors on the areola signal messages to mother's body pertaining to a specific baby's need. Yet, the few donors we have currently willing to continue pumping for Joshua all have babies of their own close to his age with the exception of one mother. The milk he will continue to receive is almost perfectly matched for his body, nutrient for nutrient. Even with the slight discrepancy in ages, human milk is still a much healthier choice over cow milk or other artificial substitutes. Human milk is designed perfectly for humans, especially young humans. Any other milk, including cow, does not compare. If mothers can breastfeed their own children for a full term duration of years, and give them all the wonderful benefits from their milk, then I want the very same for my child. I do not want to give him a sub-par subsitite when a more nutritious option is available - one that caters beautifully to his developmental needs as a human toddler. If I was able to continue breastfeeding Joshua, he would be self-weaning in his own time, with a nursing goal of 36 months. I know 3 years old might be an unrealistic goal for donor milk, but I am going to do my best for as long as I can to get him human milk. We have made it to one year and I would love to reach the WHO/AAFP recommendation of 2 years, but each day and every day is a blessing. 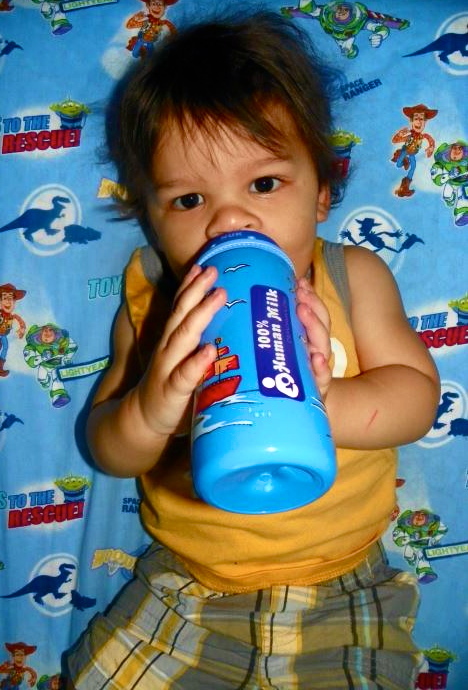 "Donating milk to Joshua turned the burden of oversupply into a blessing. 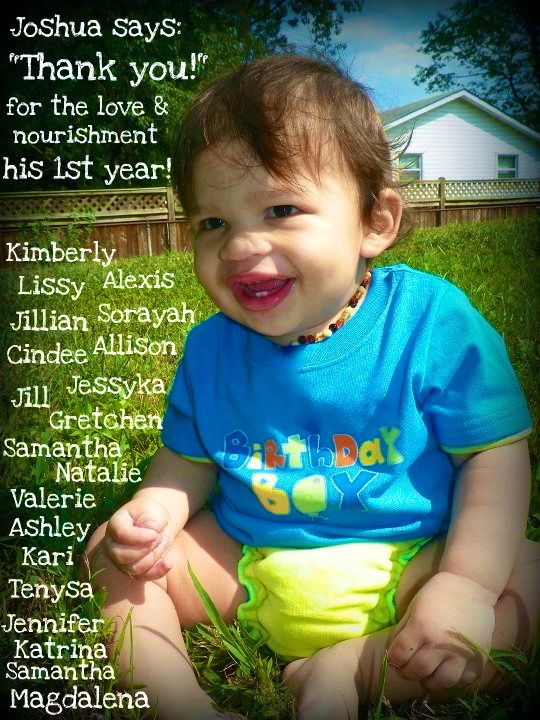 Imagine how many babies could be nourished as nature intended if all of us who have extra knew we could share it!" ~Natalie E.
"It has meant the honor of giving life - nutrition that was made for babies - to a precious child. Each child is a bundle of possibilities - our common future as a species - and preventing even just one from suffering the effects of formula when milk is so readily available reminds me of my humanness and our connection to each other." ~Jennifer A. "It might sound silly or strange, but donating to Joshua has been a life-changing experience. Giving my milk to this beautiful boy and his beautiful mama was my first experience in donating milk to a stranger. I was so honored that Lindsey felt trusting enough of me and my family to welcome my milk into their life. Joshua is one boy whose life I have been able to enrich and he is one of many children in a network of women changing the world." ~Alexis S.
"I picked him up; he looked me in the eye and reached for my hair. I looked at Lindsey and we smiled at each other. And the love I felt for this child, who was not my own, but who I helped to nourish nonetheless, was overwhelming. This. This is what it's all about. To see babies thriving, mothers smiling, and knowing that if we all come together none of us will ever have to stand alone. I choose to see my oversupply as a gift. Gifts are meant to be shared - given to people that we love. Donating milk is an incredible experience. I won't lie, pumping isn't easy at all, but I think of what Lindsey went through trying to nurse Joshua and there's just no way that I couldn't donate. It's an honor to be chosen to help feed another woman's child." ~Samantha P.
I am very thankful to everyone who has contributed to this journey so far. I am thankful to the women who are continuing to donate to us, and to their own children for wanting to continue receiving nourishinment from their mothers. After all the heartache and struggle we went through in his first few months of life, I never would have imagined that at one year old, Joshua would transition from a breastfed baby to a breastfed toddler. He is now officially "full term donor feeding." Thank you so much for the continued support and opportunity to share our story with you. Dewey KG. "Nutrition, Growth, and Complementary Feeding of the Breastfed Infant." Pediatric Clinics of North American. February 2001; 48(1). For additional books, websites, and articles geared toward nursing and milksharing mothers, see Breastfeeding Resources. Milksharing has changed my life, too! I am forever grateful for the women donating such an amazing and crucial resource! This is an amazing story. And as a mother who struggled with my own supply and wound up supplementing, I know the pain and heartache that can come with feeling that you somehow failed your baby or that something was wrong with my body because it couldn't do what it was supposed to do. Unfortunately I didn't know about milksharing before my son was well on his way to getting enough nutrition from solids that what milk I do produce was enough to eliminate our formula supplementing. I had looked a bit into milk banks online but quickly saw that that was going to be way out of our price range. In our case, my son was sick as a newborn and so didn't feed as well as he should have, causing an undersupply. Like Lindsay, I didn't pump in the early days because I'd been warned about causing oversupply, and in hindsight, I wished that I had and I probably will next time around. And if I do end up with an oversupply, I am confident that at the very least it wouldn't be wasted. Your story is awesome. Thanks for the statistics, too. Many of my friends and FAMILY have nothing but negativity when they realize YES I AM still BREASTfeeding my 3+ y.o. daughter. Power to you! Stories like this serve to remind those who will listen that our bodies were MADE for this. While sometimes, it doesn't work, either because of a difficulty with the mama, the baby, or both, our bodies are made to feed these darling little humans... not just to be sexualized. I was lucky enough to be able to pump for my own daughter when she couldn't nurse (at 17 months, she still gets less than 1% of her food by mouth). I can't even tell you how many people talked me out of going longer than her NICU stay of 3 months. We used my milk for 14 months, and the excess of a friend with a daughter her age, until supply ran dry and Lily needed something with higher calories and less fluid. I think it is important to remember that human milk is just as 'rich' and high in calories as babies need it to be - through their 2nd year of life. This doesn't mean that in your particular case your little one didn't need more, because it is tough to keep up a good supply (and high caloric milk) when not actually nursing a baby. But for those who are physically breastfeeding human milk is very fatty and baby signals to mother's body her needs via receptors in the areola. For most of human history, and in most places around the world today, babies receive very little other than mother's milk for the first 24 months or so of life - and thrive. The myth is a common one that I hear from mothers - "he needed more calories, so we had to supplement." Just did not want it to be continued here. But there are special situations, and yours certainly sounds like one, where other means of feeding are necessary. Again, way to go for pumping for 14 months! Your daughter is blessed indeed. Wish I had known about milksharing sooner! My son was not ready to be born. At 37w3days my water broke. I had tested positive for group b strep and was scared into going to the hospital as soon as there were any signs of labor. I went. And my body shut down. I am afraid of needles and the hospital smell makes my blood pressure sky rocket. Long story short, after 22 hours of active, pitocin induced labor and three hours of mostly non productive pushing, my little guy came into the world sunny side up with one hand next to his chin - this presentation at birth caused a dislocated jaw and several dislocated skull plates that went undiagnosed for six weeks. After birth, he was poked, prodded, bathed, medicated and circumsized. He slept for 18 hours. No skin to skin contact was had and he attempted to nurse one time. My sweet baby blue-faced screamed for the first six weeks of his life. He would suckle constantly. I was told he was just colicky. But at his 6 week appt, he was diagnosed failing to thrive and no one would help me. I was told formula was the only option. I sobbed every time I gave him a bottle. With the stress and the fact that for those first six weeks he wasn't really getting any milk, my supply was doomed. I could pump less than an ounce total if I didn't nurse him first. He was severely allergic to 17 kinds of formula (vomitting, diarreah, rashes, ect) and after 5.5 months, I finally convinced the doctor to write him a Rx for breastmilk from the Mother's Milk Bank. He gained 4 pounds in a month - more than he'd gained in his first 6 months of life. By 9 months, he was no longer failing to thrive and our Rx was cancelled. The milk bank advised we try goat milk and that's what he has been drinking since then. Had I known about milk sharing, it would have been a totally different story from the beginning. The world was not kind to my sweet boy, but thanks to possibly hundreds of other moms, he was given a chance to be healthy. It wasn't easy, but hopefully by sharing my experience I can help someone else. Thank you for educating others and bringing to light milk sharing. Sadly we had to supplement my preemie twins with bad results. (not tragic but bad) they are now fully breast fed almost 7 month olds but the 2 weeks of supplementing formula was horrible. (we were transitioning from pumping to directly feeding) thankfully my body responded and they haven't supplemented since. I know they would have been far better on all human milk.